Following graduation from fashion school, Steven found inspiration in the beautiful, fashion capitals of the world for many years, as a VP of design at Munsingwear, Perry Ellis and other [international design houses]. His creative work experiences brought him back to his favorite medium again, the one that always inspired him the most, the imaginative world of fiber arts. Today, you will find Steven in a 6,000 square foot, restored, 1800's Firehouse, adorned with chandeliers, animal prints, and his eclectic collection of objets d'art from his international travels. On any given day, you'll see him encouraging his knit-crochet-fiber loving friends to push the limits, hosting a party at his fantasmagorical store and always pouring out his latest designs, [Steven has changed the definition of "yarn shop" forever]. 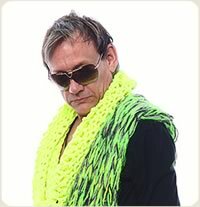 Steven's knitwear designs of 'chunky funky' creations have caught the attention of Hollywood celebrities and stylists. His creations are regularly featured in national publications, and are available on popular knitting websites. Steven Berg is a fiber artisan who is armed with a wealth of experience, a daring sense of style, and a firm belief in the transformative power of creativity that knitting or crocheting offers to all who are brave enough to push the boundaries. Steven began his career as a young boy, furiously knitting lines of sequin dresses for a discerning clientele of Barbies in Wisconsin. This naturally led him to become a star student in fashion design at both Parsons and the Fashion Institute of Technology in New York City. Steven's keen sense of fashion naturally led him to become a star student in fashion design at both Parsons and the Fashion Institute of Technology in New York City.